Wish there was one place to find everything to run your coaching business? Organize your marketing, online scheduling, client management & online billing from the industry’s leading, all-inclusive application. Used by thousands of coaches to set up their professional coaching business to deliver a constant stream of clients and steady cash flow. I’ve known Kate and Melinda personally for many years, and they’re brilliant when it comes to software and marketing. They have high integrity and an unshakable commitment to their clients. I’ve been inside the Coaches Console software and kicked all the tires. I’m convinced that it’s simply the best solution for most coaches. Your other option is to combine a whole bunch of other solutions and try to make them work together. That option is both more expensive and more complicated. I recommend going with Coaches Console. Coaches Console is a revolutionary resource essential to any serious Coach. The bonus benefit is that this valuable organizational tool is delivered by Kate & Melinda – two high integrity Luminaries with a rare but sincere dedication to and care for all of their clients. Don’t think – jump at the opportunity to work with them! 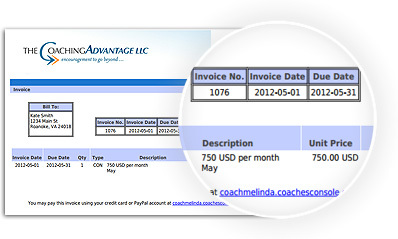 Founder & President – Coach Training Alliance You can tell this system was developed by experienced coaches. It takes the fear out of the business and marketing side of coaching. A must have! Welcome to the industry’s leading tool to organize & automate your professional coaching business – in a single, all-inclusive application. 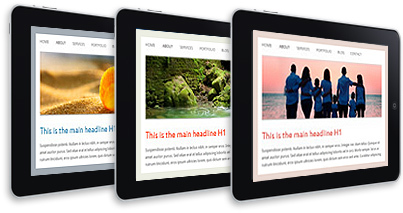 Establish your professional image by launching your marketing website and integrate a private client website in minutes with our templates and pre-uploaded content, forms & documents. Market to your prospects and communicate with your clients through custom-branded email messages, broadcasts, autoresponders and newsletters. 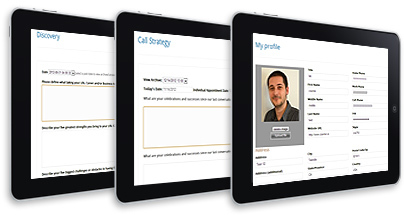 Schedule and manage your sample sessions with prospects, individual client appointments and even group appointments. 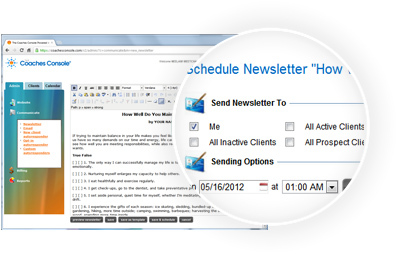 Syncronize your calendar with Outlook, iCal, Google calendar and others. 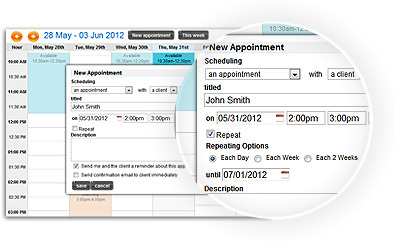 Plus generate automated appointment reminders directly linked to interactive forms. 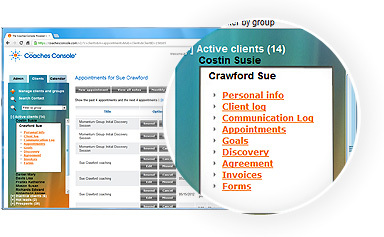 Keep your client management simple and organize; in one place: forms, agreements, appointments, invoices, payments, notes, progress and other activity. Manage your billing and business financial data: create custom-branded invoices, process and track payments, send receipts, generate reports and integrate with QuickBooks accounting software. Pre-uploaded material ready to use with your clients: Welcome Packet Forms (Intake, Goals, Call Strategy), Client Agreement Templates, Post Session Recap form, Mid and Post-agreement Evaluations, Testimonial Form, Teleclass Etiquette Guidelines, Credit Card Authorization Form and more! The Quest For Building Your Business Just Got Easier! It’s more than a web-based technology. You have access to an entire ecosystem to organize and automate your professional coaching business. The wisdom on how to set up your business, engage your clients and make money as a coach. Plus learn how to use the industry’s best technology to streamline and automate your business. Direct Access to our team of trainers and programmers to provide you with guidance and support for your every need. Access the searchable knowledge base to locate short, 2-3 minute training videos to answer your every question. Join co-founder, Melinda Cohan each week as she teaches you tips to making the most of your Console system. Plus… ask your questions on the live webinar and receive one-on-one, personal support. Combine the Checklist with the 30 day 100% money back guaranteed trial and you will get a step-by-step road map to start your business AND the technology to make it happen. Twice a month join co-founder, Kate Steinbacher, as she hosts free webinars bringing you the industry’s leading experts on marketing and coaching skills.